A tiny glass capsule about the same size as a grain of rice containing an identification number that is individually linked to the details of you and your pet. If the unthinkable happens and your pet goes missing, a vet, rescue centre, dog warden or anyone with a small hand held microchip scanner can scan your pet which will show the number of the microchip in your pet. This number is registered with petlog run by the Kennel Club. Petlog will confirm the details and you and your pet will be reunited. where is the implant sited ? 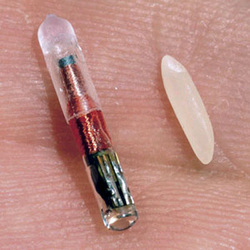 How long will it take to implant the microchip ? 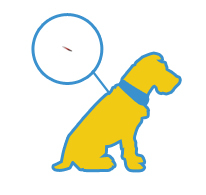 The microchip is implanted in a matter of seconds, about the same time it takes for your pet to get their vaccination. Once you have completed your petlog registration form, which takes a couple of minutes your pet is protected by the latest I.D. technology. How long does registration last ? Your pet is registered for life! How old does my pet have to be, before he/she can be microchipped ? This depends on the size of the animal, for example larger breeds of dog can be chipped at around 7 weeks old,(puppies should still be with their mum till at least 8 weeks, however a breeder can have their litter microchiped before they go to new homes.) Some smaller breeds may be better waiting till they are 9 or 10 weeks old. Smaller animals like kittens etc could benefit wait till they are a couple of months old. Can all scanners read a chip supplied by pet-detect ? Pet-detect, (who supply me with my equipment), use they latest technology from Germany (FXD-B) and can be read by all scanners. Perfect for pets who travel. 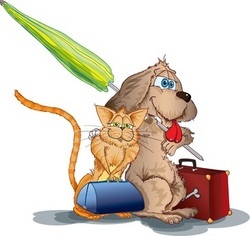 If you plan to travel abroad with your pet for showing or simply a holiday your pet must have a microchip in order to comply with travel regulations. Now that my Dog is microchipped does he/she need to wear a collar ? 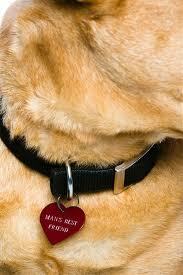 By law your dog must wear a collar and an identification tag with at least your surname, address and a contact number. There are a variety of tags out there and you are guaranteed to find one you like. You should always check your tag is still legible as some may wear away over time. My preference are tags that are deeply engraved, some companys even embroider contact numbers into the collars themselves . How long can the Dog Warden keep a stray dog that has no form of identifacation in Scotland before the owner looses ownership? what happens if I move or change my phone number. can I update my contact details ? you can change your details at ant time either online or over the phone, you will need to make an online owners account on petlog. for a one off payment of £10 you can upgrade to a petlog premium account which means you can change your details as often as you like with no extra charge. Petlog Owners - Guide to the website. What other benefits are there to to microchipping my pet? As well as a permanent identification that will allow you and your pet to be reunited, a microchip can also allow you to control what animals enter your home. 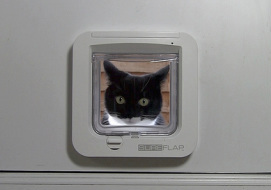 For instance, if you have a cat flap and have a problem with stray cats entering your home when you are not in, or do not want them in at all, there are products that are designed to read and recognise your pet's microchip..... unlocking the cat flap for your pets. This has also been introduced in dog flaps as well, to prevent burglars from entering your home.